Although only a medium sized hill, all of Slievemeen’s 472 metres rise above Carlingford Lough giving it a commanding position and fine views. 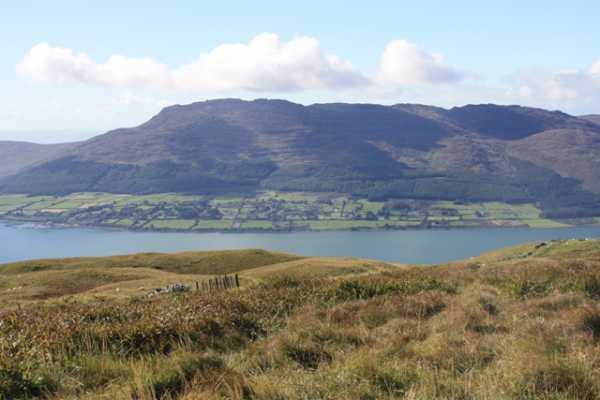 Most notable are the views of Carlingford Lough itself and across to Slieve Foye & both Foxes and Ravens Rock, although the views out to sea and up towards Black Mountain are great too. 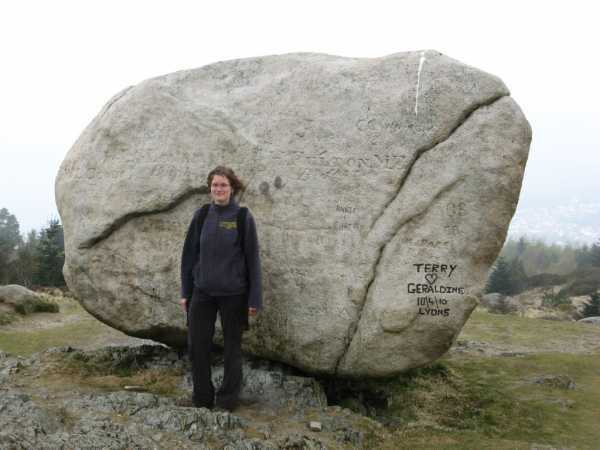 The summit is marked by a little pile of stones that is too modest for this singular viewpoint. I parked at the well used large car park at J196 174 A. This was bustling with people having barbeques, playing sports and wandering along nearby tracks. There were horse riders, mountain bikers and plenty of hikers. I had absolutely no concerns at leaving my car there. It is always a bit worrying parking a car in unfamiliar places but this really felt like a secure starting place. At the end of the car park is a notice board with maps, colour coded routes and general information. Beyond this is a track where there is a choice of two 'black arrow' routes. 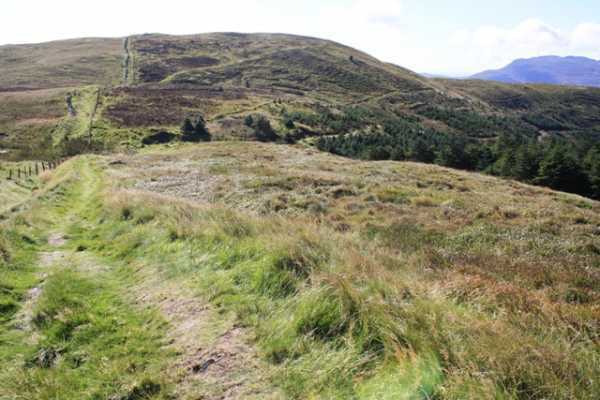 By taking the left route, and following the arrows, I headed up through the forest to the col (J202 174 B)between Slievemeen and Slievemartin in about 25 minutes. Another 10 minutes along a fence brings you to the few stones that mark Slievemeen's summit at J201 169 C. The views were fantastic in the good weather. The Cooley's were so near and so far south across Carlingford Lough, basking in the sunshine. Warrenpoint and Rostrevor were only a stones throw to the west. The Irish Sea glistened and sparkled off to the east. Shanlieve, Binnian and distant Bearnagh were distinctive among the spread of hills to the north. 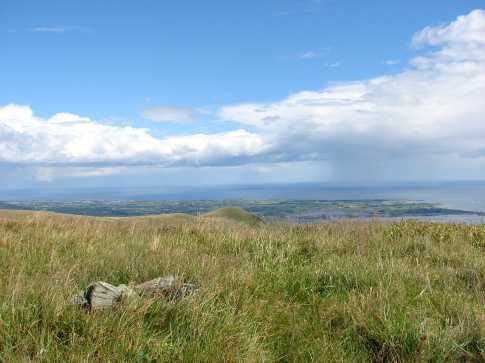 Picture from csd : The modest summit and the view SE over Slieve Fadda and Kilkeel. 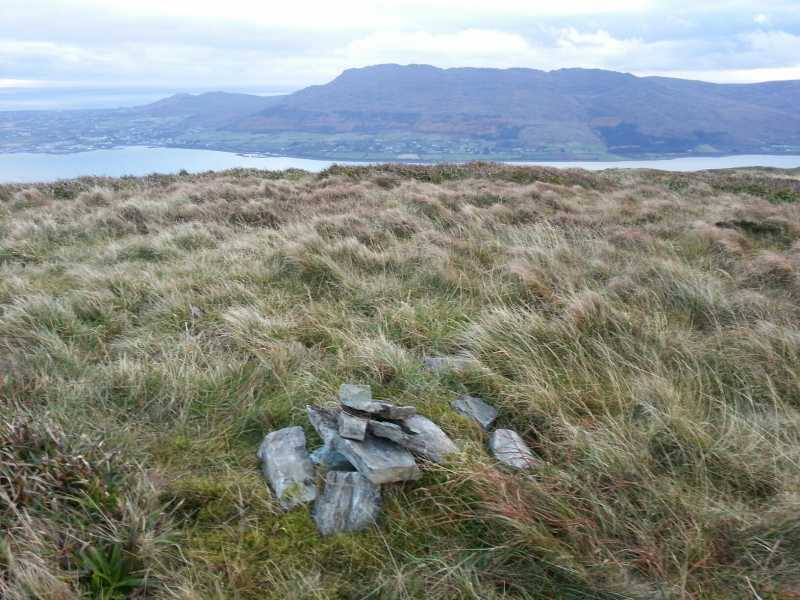 Picture: The modest summit and the view SE over Slieve Fadda and Kilkeel.